Puerto Vallarta fishing charters in February. 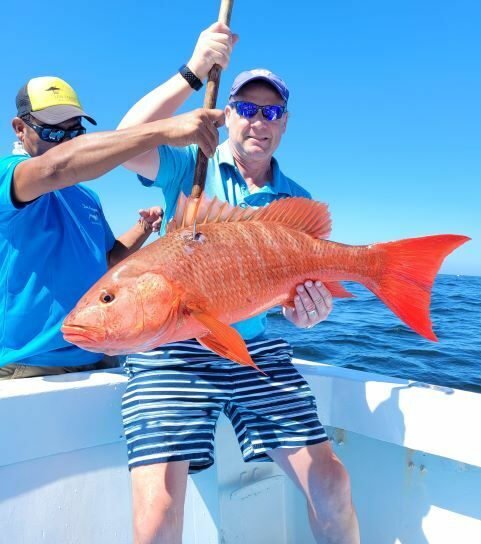 The fishing charters here in Puerto Vallarta Mexcio for February have not changed much since last January our latest fishing report. The good news is we're seeing more sardines showing up which is drawing in some of the bigger fish like the striped Marlin which showing up in good numbers. Mahi-mahi are still hanging around as the water temperature is still holding 78-79 and even up to 81° in some of the offshore fishing places. The sailfish are still here inside and around the bay. On the last couple trips that we've done here in Puerto Vallarta Mexico we've produced some of the sailfish here inside the bay mixed in with a few striped Marlins. The best action has been offshore working some of the thermoclines lines that we're seeing on the Terrafin satellite this is puts us on top of some really great fishing action. The fishing action around Puerto Vallarta has been incredible for the shorter trips. We are catching the yellowtail ,Spanish mackerel and in good numbers, There has also been sailfish and a few striped Marlin. Been seeing some of the roosterfish show up here in the bay which is good news for everyone. As I said before the sardines are moving up the coast and we're seeing a lot of the birds working on top of the water which is pointing us directly to where the fish are hitting. The Nuevo Vallarta fishing report is very similar to the Puerto Vallarta fishing report. We've been working the fishing area and over by La Cruz Huanacaxtle on the North Shore for some of our inshore fishing action for our to 6 hour trips. This is producing some good fish and some really good numbers. As a special note here on the inshore fishing the whale watching just been incredible and I'll try to include a few of the great videos that we've been taking. It's always nice to be out fishing and to take a short break to see these magnificent humpback whales that come here each year from Alaska. The Punta Mita fishing report has been with the offshore action. The three great places that we've been fishing or the El Morro, Corbetena and of course our old standby favorite El Banco still seeing some of the big tuna is out there 50 to 80 lb. striped marlin good numbers and the sailfish up north towards Sayulita. Best action for offshore has been skipping baits and using some Pitch baits. One of out favorites is live baiting at some of the areas that I have listed above this almost ensures us for a good game. To Sayulita fishing report is good As It Gets there's been some red Snapper showing up and some roosterfish, and great Spanish mackerel action. There has been also good striped Marlin and sailfish action. Just a little farther north from Sayulita fishing has been some incredible mahi-mahi action. from Puerto Vallarta Mexico where the friendliest people in the world live.